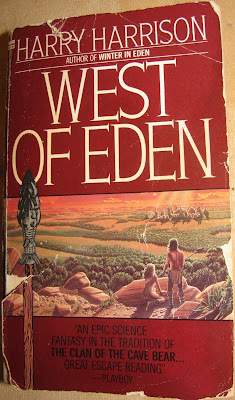 West of Eden is one of Harry Harrison’s more notable works of science fiction. I gravitated to it because of its extensive world building. 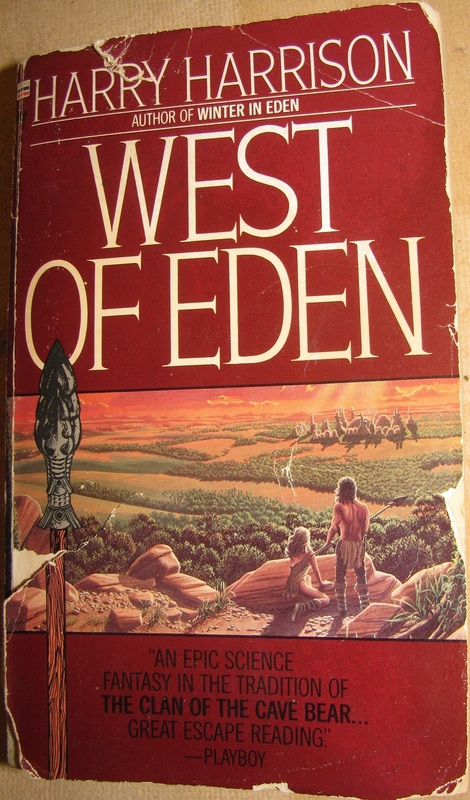 West of Eden was first published in 1984, just a few years after Jean Auel’s ‘Clan of the Cave Bear’, and there are similarities in the ‘feel’ of the two books. Both carry the reader into hypothetical worlds occupied by stone-age humans and a significant antagonist species. In the case of Auel, the species is the Neanderthal. In the case of West of Eden, it’s a much bolder premise: What if the dinosaurs didn’t go extinct, but instead evolved into intelligent beings? West of Eden takes place at the onset of an ice age. The cold blooded intelligent dinosaurs are looking for a new place to establish one of their organic mega-cities because one of the established cities, built all of living, bio-engineered trees and other plants, is dying as the climate cools. The location they choose is across the ocean from all their previous cities. Yes, somehow the dinosaurs had never colonized North America. That’s one of several plot devices that, for me, required a suspension of disbelief. How could a species that originates in the ocean, has ocean-going capabilities, and has a multi-million-year history of intelligence not have previously populated every corner of their world? Yet even more difficult to swallow is the fact that these intelligent dinosaurs do not use fire in any form and barely seem to understand or appreciate how it works. This despite the fact that they have capability in medicine, bio-engineering and many other disciplines comparable to or exceeding those of 21st century real world humans. Okay, so suspending my disbelief, I plunged into the story and thoroughly enjoyed it. Almost as soon as the dinosaur colonists arrive in the ‘New World’ they have a bloody encounter with the stone age humans, who apparently evolved from new world apes and do not live on any other part of this world. The dinosaurs capture a human boy, Kerrick, who becomes the focal point of the story. After years of captivity during which he learns much about Yilanè (dinosaur) culture, Kerrick escapes and returns to his own people. The remainder of the tale centers on the efforts by both sides to eradicate the other, utterly and completely. Harrison chooses to entirely dismiss the possibility of co-existence. The human culture is reasonably familiar—taking many cues from Native American cultures. But the effort spent by the author to create a rich Yilanè culture and language is a true tour de force. So although the conflict and resolution of the plot are not particularly compelling or original, it is this exquisite example of the Sci-Fi author’s craft of world building that earns ‘West of Eden’ a solid 4.5 out of a possible 5 stars. Highly recommended.